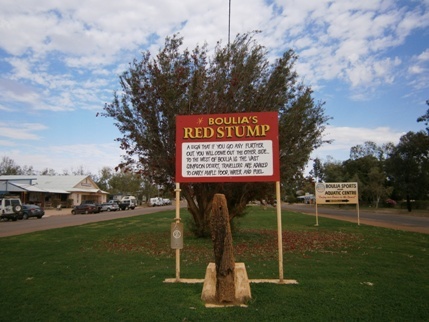 Located on the median strip between the Australian Hotel and the Waddi Tree store on Herbert Street, this is Boulia's answer to the Black Stump. The last recognised Corroboree Tree of the Pitta Pitta tribe. 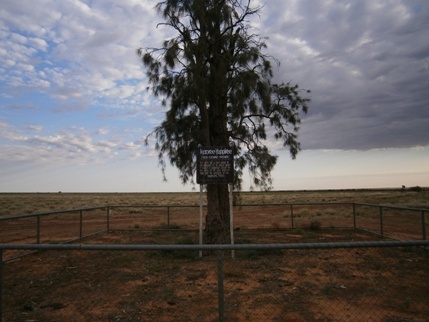 This tree can be found behind the Boulia State School. This is a distinctive Wadi (Acacia Peuce) tree, which can only be found in the Boulia/Diamantina Shire and on Andado Station. These trees can live for 200 years. They are formed by chemical action in sedimentary rock. These local concretion being parts of the Toolebuc formation which was set down as sediment on the bed of the last inland sea (about 100 million years ago). A small fossil or pyrite crystal acts as a nucleus. Mineral matter dissolved in groundwater moves through the porous rock and builds in concentric layers around the nucleus. Concretions are usually made of iron oxides, calcium carbonate or silica. They remain as hard lumps after the host rock has worn away. Some concretions can be found almost totally encased in a caramel or ironstone chert (silica).